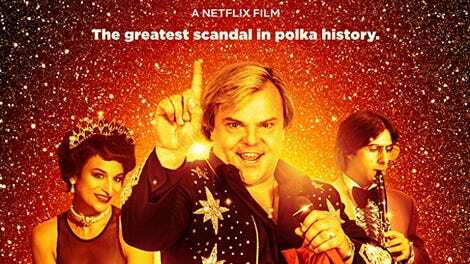 Very late into the true-story comedy The Polka King, polka singer and entrepreneur Jan Dewan (Jack Black) is aghast when his wife, Marla (Jenny Slate), tells him that people associate her with his financial crimes. “You don’t know anything!” he protests in heavily Polish-accented English, and then comes the kicker: “I barely know!” In general, and especially given what the movie has shown over the previous 90 minutes or so, it’s an absurd statement. But above all else, this movie is so well-cast that the laugh line makes perfect sense coming from Black. He’s ideally suited to playing a man too gregarious, and too in love with the sound of his own singing, to fully calculate the cost of his actions, which in this case include running a Ponzi scheme so merry that its victims take the better part of a decade to even vaguely suspect a problem. Slate is similarly convincing playing a woman whose faith in her husband blinds her to any malfeasance on his part, and who grows disgruntled only when his dubious achievements leave her on the sidelines. Slate’s fellow SNL alum Vanessa Bayer has a much smaller part, barely speaking, but she’s still funny as a woman hired, semi-inexplicably, to dance along with Jan’s polka band while wearing a bear costume and grinning as hard as possible (a Bayer specialty). And Jason Schwartzman, as Jan’s multi-instrumentalist right-hand man Mickey, excels at fuming over the cheapness of polka fans who love Jan’s band yet balk at paying a $3 admission to see it. Not everyone is so stingy; eventually, Lewan is able to collect a series of “investments” in his low-paying polka project and various associated businesses. This despite an early visit from Ron Edwards (J.B. Smoove), an officer with the SEC, who warns Lewan off his Ponzi-style string of checks (which in the movie’s telling seems to originate at least in part from Lewan’s naiveté). 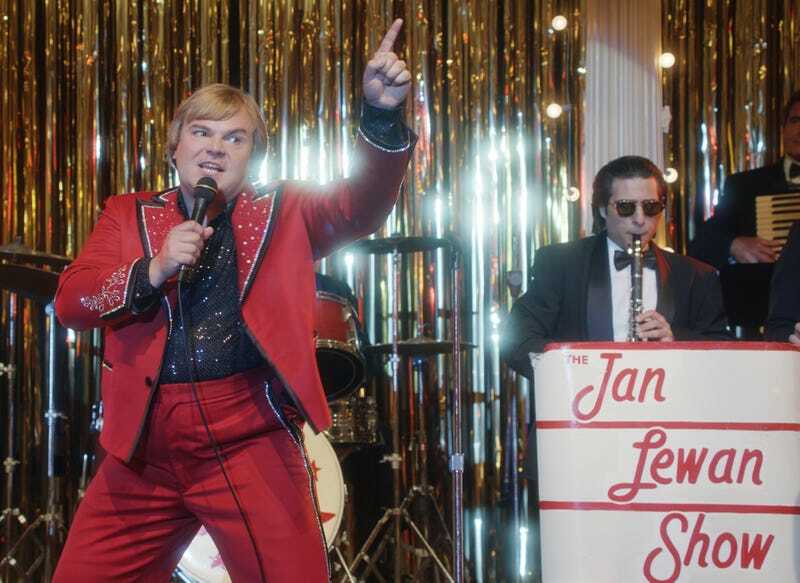 The Ponzi scheme is now familiar enough as a movie plot point to create its own sense of expectations; The Polka King sending the authorities after Jan so quickly (albeit ineffectively) feels almost innovative. It could also be that the movie’s agreeably by-the-numbers treatment makes any scraps of cleverness feel more substantial than they really are. The Polka King, adapted from a documentary called The Man Who Would Be Polka King, is supposed to be one of those true stories where real-life craziness outstrips any mere fiction. But director Maya Forbes, who wrote the film with her husband, Wallace Wolodarsky, never gets a handle on those fictionalizations. Plot developments, exposition, and confrontations alike are all staged through clumsy dialogue scenes. The cast performs these scenes entertainingly—Black’s dancing eyes remain as compelling as ever—without ever transcending how unfocused and flatly shot they are. The material is too “true” for punchlines but not so crazy that it couldn’t use some more of them, or at least some more of Bayer’s insane grin. Instead, The Polka King pushes a lot of facile quasi-satire, secretly searching for an actual topic or target beyond, like, the American dream, or something. It comes closest to a point worth making when Forbes stresses the shapeshifting quality that some Americans find weirdly comforting in immigrants, made clearest in the casual revelation that Jan, when pressed, has absolutely no opinion about how to pronounce his own name. (Most people go with “Yon,” but Marla insists on “Jan” with a hard “J,” and he’s downright evasive on the subject.) There are further intimations of weird assimilation rituals when Marla’s beauty-pageant training is styled into a music video of Jan expressing his love for her or when Jan performs an impassioned “polka rap” (it’s real). These seem like points Forbes, who wrote on Larry Sanders, and Wolodarsky, who wrote on golden-age Simpsons, should be more than capable of expanding upon. The Polka King isn’t expansive, though. It’s fleet and amusing as it springs between mildly odd episodes involving bribery, Pope John Paul II, an under-patronized gift shop, and Jacki Weaver screaming a lot as Marla’s suspicious mom. It comes close to insight, but ultimately it barely knows.